Methane hydrate was discovered only a few decades ago. Various estimates suggest the energy locked up in methane hydrate deposits is more than twice the global reserves of all conventional gas, oil, and coal deposits combined, but the technical challenges of extracting that energy source have been slow to resolve. Now, U.S. Energy Secretary Steven Chu has reported the successful completion of a test of technology in the North Slope of Alaska that was able to safely extract a steady flow of natural gas. The achievement may open up the vast untapped resource to future production, yielding not just gas but economic and energy security and further strengthening US efforts toward energy independence. North America’s newly accessed abundance of shale-derived natural gas has motivated North American OEMs to develop several new natural gas vehicle (NGV) products over recent months, in response to renewed demand. If deemed economically accessible, the methane hydrates may stimulate even more demand for NGV choice and CNG/LNG refuelling infrastructure. 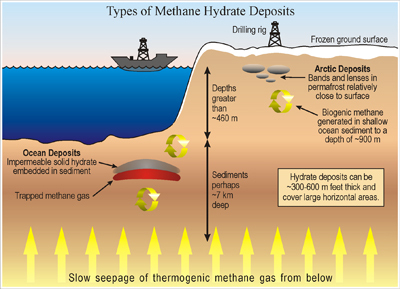 Methane hydrates are 3D ice-lattice structures with natural gas locked inside, and are found both onshore and offshore – including under the Arctic permafrost and in ocean sediments along nearly every continental shelf in the world. The substance looks remarkably like white ice, but it does not behave like ice. When methane hydrate is “melted,” or exposed to pressure and temperature conditions outside those where it is stable, the solid crystalline lattice turns to liquid water, and the enclosed methane molecules are released as gas. The Department of Energy has partnered with ConocoPhillips and the Japan Oil, Gas and Metals National Corporation to conduct a test of natural gas extraction from methane hydrate using a unique production technology, developed through laboratory collaboration between the University of Bergen, Norway, and ConocoPhillips. This ongoing, proof-of-concept test commenced on February 15, 2012, and concluded on April 10. The team injected a mixture of carbon dioxide (CO2) and nitrogen into the formation, and demonstrated that this mixture could promote the production of natural gas. Ongoing analyses of the extensive datasets acquired at the field site will be needed to determine the efficiency of simultaneous CO2 storage in the reservoirs. This test was the first ever field trial of a methane hydrate production methodology whereby CO2 was exchanged in situ with the methane molecules within a methane hydrate structure. As part of this exchange demonstration, the depressurization (i.e., production through decreasing pressure of the deposit) phase of the test extended for 30 days. The prior longest-duration field test of methane hydrate extraction via depressurization was six days (Japan-Canada 2007/2008 Mallik well testing program). This testing will provide critical information to advance the Department’s efforts to evaluate various potential gas hydrate production technologies. The next stages of the Department’s research effort will be aimed in part at evaluating gas hydrate production over longer durations, likely through depressurization, with the eventual goal of making sustained production economically viable. While this may take years to accomplish, the same could be said of the early shale gas research and technology demonstration efforts that the Department backed in the 1970s and 1980s. Following the successful completion of the latest round of testing the Department of Energy says it will launch long-term production tests in the Arctic. “We’re also making $6.5 million available for research into technologies to locate, characterize, and safely extract methane hydrates on a larger scale in the U.S. And as part of the President’s budget proposal for Fiscal Year 2013, the Department is requesting an additional $5 million to further gas hydrates research,” said Chu.